Hi! 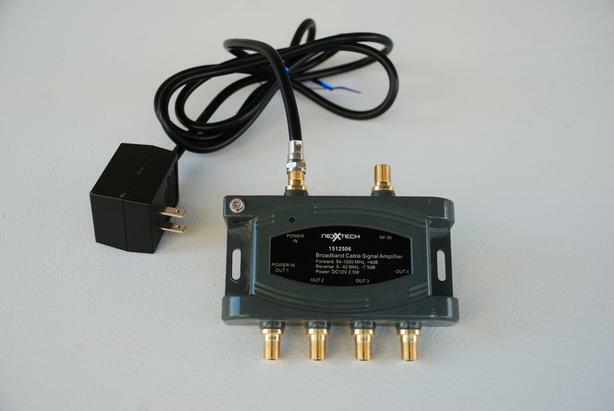 I have a Nexxtech broadband cable signal amplifier model number 1512506 (DC 12V 2.5W) with an AC adapter for sale. It is very solidly made of metal (grey) measuring 5" x 2.75' x 1.25' not including the ports. This is the only info I was able to find about it from a third party so I hope this helps: "Use in CATV drop cable two-way multimedia network. Aluminium housing eliminates RI and heat-sink. KV surge protection on all ports. Very low noise. High port-to-port isolation and good gain flatness. Selling for $75 + tax." This piece of tech was added to my TV/stereo system by my service people to boost my TV signal. It was in place for about six months and then they changed my system and decided to take it off. So it seems I have no more use for it and that's why I am selling. I am asking $30 for this signal amplifier. I am located in Vancouver, BC but shipping is no problem. I will be happy to mail this Nexxtech amplifier to you using CanadaPost and Interac bank transfer. So, if you are interested in purchasing, e-mail me and we'll figure out the logistics and/or I can answer any questions you may have. Thanks!